Your Journey Through U.S. History Starts Here! Unit #2: The French And Indian War Begins! Learning Target: I can ANALYSE why England and France fought a series of wars for control of North America before 1763. Today you will be starting a new Live Binder :-) Follow the directions below. You will also be creating a tab for your learning targets and a tab for this assignment. 1783 that led to the birth and independence for the United States of America." Hint: You may want to copy and paste this description into your Live Binder account. 3. Now, copy and paste the following learning target into your LiveBinder. Be sure to include today's date. 4. Now, create a new tab in your LiveBinder titled "The French and Indian War Begins" for this assignment. 1. Type the following title into your LiveBinder text box: "Part I: How A Map Can Predict the future"
A. List each nation that claimed parts of North America before 1754. B. In your LiveBinder text box, write at least three sentences PREDICTING what could happen if these nations are all in competition for land and resources in North America. A. List each nation that claimed parts of North America in 1763. C. Based on your map analysis, explain why you believe the map has changed. In other words, what could have caused the map to change? 1. Type the following title into your LiveBinder text box: "Part II: French and Indian War Advanced Organizer"
2. Take a moment to watch the short entertaining video that goes over the entire French and Indian War. 3. After watching the video, make a list of all of the French and Indian War names and places mentioned in the video. See how many you and your group can list! 4. Conduct an Internet search to find a picture of George Washington during the French and Indian War. Save it to your computer and upload it to your LiveBinder media box. Part III: The Conflict For The Ohio Valley Ignites! 1. Type the following title into your LiveBinder text box: "Part III: The Conflict For the Ohio Ignites!" 2. Copy and paste the questions below into your LiveBinder text box. These questions will help us learn about the beginning of the French and Indian War. A. Why did the French build a string of outposts or forts around the Great Lakes and the Ohio River Valley? B. 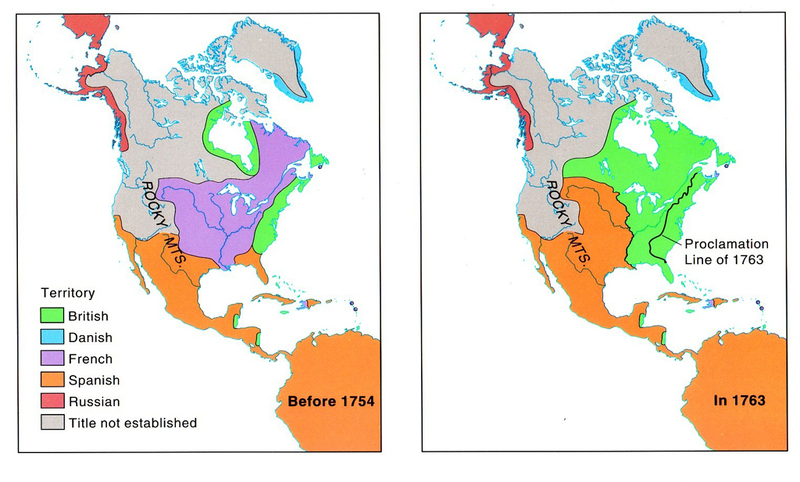 Why did both the English and the French compete for control of North America in the 1750s? C. Who was chosen by the Governor of Virginia to tell the French to leave the Ohio River Valley? D. How did the French answer George Washington's request? What did the French tell George Washington they planned to do in the Ohio River Valley? E. Which three rivers make up the "Forks of the Ohio?" F. What was the name of the massive fort the French built at the Forks of the Ohio? G. How do you think George Washington felt after his first battle? H. Why do you think the murder of the French commander by the Half King was a major problem for George Washington following the battle? I. What was the name of the fort Washington built to defend his men from a French attack? J. What was a major mistake Washington made when creating Fort Necessity? K. What was Washington forced to do at Fort Necessity? 3. Watch the video montage The Conflict For The Ohio Ignites ! Answer the questions in your LiveBinder text box. You may want to pause the video to each question in your LiveBinder. *If the video does not work for you, or if you would like to use additional resources, click on the "Explore this topic" image. Use boxes 1-10 to help you answer the questions. 1. Type the following title into your LiveBinder text box: "Part IV: Exploring Primary Sources"
2. Click on each of the thumbnails below to view the primary sources. Read each of these primary sources carefully. Answer the corresponding questions in your LiveBinder text box. A. According to his letter, Dinwiddle beleives that the Forks of the Ohio River belong whom? B. According to his letter, what is Dinwiddle suprised to hear the French has constructed near the Forks of the Ohio? C. What does Dinwiddle claim it is his duty to requiere of the French? *Primary Source #2: Major George Washington's account of his journey back to Virginia after delivering Dinwiddle's letter. A. According to his account, how did George Washington almost die returning to Virginia after his first mission into the Ohio country? B. Where did George Washington meet Governor Dinwiddle upon his return to Virginia? What did he give the governor? C. How do you think U.S. History might have been different if George Washington would have died returning his first mission into the Ohio country? 3. Watch the video montage The Conflict For The Ohio Ignites ! Answer 8 of the 12 on screen questions below in your LiveBinder text box. You may wish to pause the video to answer the questions. A. Explore boxes 3-6 in the French and Indian War materials. Use your best descriptive words to describe each of the following uniforms: English, French, Indian, and American Militia. B. Explore boxes 8-12 in the French and Indian War materials. Use your best descriptive words to describe what for For Duquesne / Fort Pitt would have looked like during the French and Indian War? C. Use descriptive words to describe what the area around Fort Duquesne / For Pitt looks like today. 3. Conduct an Internet search to find a picture of George Washington during the French and Indian War. Save it to your computer and upload it to your LiveBinder media box.